"Fine Wine and Hidden Treasures "
Theme: Fine Wines & Hidden Treasures is an evening of exceptional dining, featuring an exclusive wine tasting and auction, as well as the pairing of wines specially selected by Southern Wine & Spirits of South Florida, Dreyfus Ashby & Co., and Transatlantic Wine & Spirits, to accompany a culinary masterpiece created by The Ritz-Carlton's Executive Chef, Ryan Artim. Mission Statement: Food For The Poor, Florida's largest charity and the largest international relief and development organization in the United States, serves the poor of the Caribbean, Latin America and the U.S. Food For The Poor provides food, emergency relief assistance, clean water, medicines, educational materials, basic housing, support for orphans and the aged, skills training and micro-enterprise development assistance. More than 96% of all donations received in 2007 went directly to programs that help the poor. 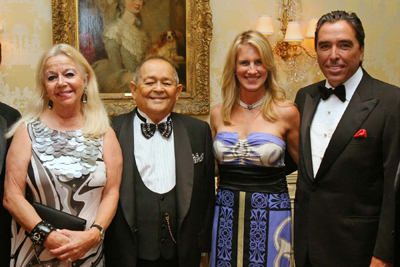 has served as Bailli-Confrérie de las Chaines des Rôtisseurs of Palm Beach for 25 years. in the nation, feeds millions of hungry poor in 17 countries of the Caribbean and Latin America. We provide emergency relief assistance, clean water, medicines, educational materials, homes, support for orphans and the aged, skills training and micro-enterprise development assistance, with more than 96% of all donations going directly to programs that help the poor.